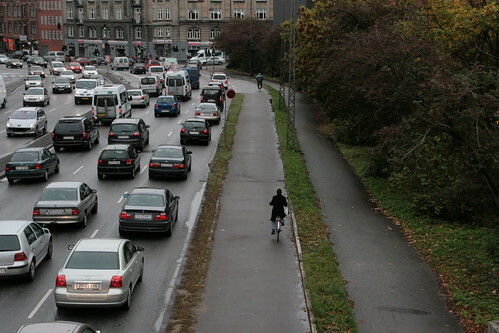 Between 200 and 500 people in Denmark die every year because of the noise generated by traffic. A recent Swedish study of 30,000 people in the province of Skåne has confirmed what many other studies have suggested. That the noise generated by traffic causes higher blood pressure and increases the risk of heart disease, strokes and blood clots. "We have determined that at noise levels over 60 decibels there is a connection between high blood pressure in the young and the middle-aged and that it's an important risk factor in relation to heart disease and strokes", says Theo Bodin from the University Hospital in Lund. Normally traffic noise is considered harmful when the levels are over 55-59 decibels - dB(A) - on average in a 24 hour period, and very harmful if the level is over 65 decibels. For example, a level of 58 decibels is what you'd get 200 metres from a road with 20,000 cars each day. The results of the Swedish study show that it is the age group 40-60 years and young adults that are most affected by the noise of traffic. When a person is exposed to traffic noise, the sounds trigger a reaction in the form of stress, which affects the nervous system. This, in turn, affects the body's endocrine glands and stress hormones are released into the blood. In order to handle the 'attack' the body reacts with higher pulse and blood pressure which increases the risk of heart disease. A Danish study in the same vein is in the works, involving 57,000 people. It is expected to wrap up in a year and a half. According to the Danish Environmental Agency (Miljøstyrelsen) there are 700,000 Danish homes that are in the 55+ decibel zone. Among them there are 150,000 homes exposed to more than 65 decibels. On the positive side, persons between 60-80 aren't affected as much. Possibly because of reduced hearing but also because they have become used to the noise. On the negative side, it is estimated that between 200 and 500 die each year in Denmark due to noise-related illnesses. A previous post here on Copenhagenize.com covers how traffic kills ten times more people than traffic accidents. Fortunately, we have cycling to tackle these issues.